Alexander Blok composed many of his verses at a lovely estate just outside of Moscow. 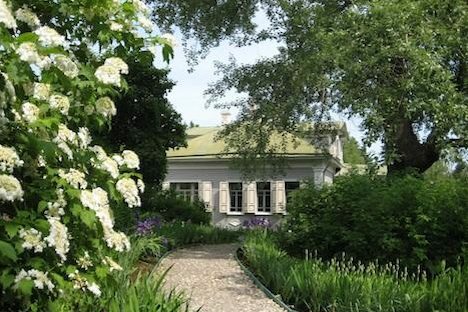 The symbolist poet Alexander Blok is not very well known outside Russia, but the beautiful country estate of Shakhmatovo, where he grew up, is worth visiting even if you have never heard of him. Blok’s grandfather called it “a corner of paradise not far from Moscow” and from the first sight of the gray wooden house on the crest of the hill, the description rings true. Set among flowering meadows in deep countryside just over an hour north of the capital, this hidden treasure makes a great outing from Moscow. It was the famous chemist, Dmitri Mendeleev, inventor of the periodic table, who first encouraged Blok’s grandfather, botanist Andrei Beketov, to settle in the area. The young poet would walk for miles with his grandfather, searching for botanical specimins. Blok eventually married Mendeleev’s daughter, Lyubov Mendeleeva, whom he met while he was out riding. In the village of Tarakanovo near a tranquil pond, surrounded by white benches, is the scaffolding-clad ruin of the Church of the Archangel Michael, where Blok married Lyubov. A bronze monument to the couple, in the vein of Moscow’s statue of Pushkin and his wife, stands behind the church above a verdant valley. Tarakanovo is just a cluster of cottages and one shop, set in gently rolling fields. A sign near the bus stop directs visitors down a small lane to a museum by the pond and church in pleasant gardens. The three rooms in the old “Land Captains’ School” have been made into an exhibition: collections of photographs, letters and pictures that introduce you to Blok’s family and the neighboring Mendeleevs who lived seven kilometers away at Boblovo. Some of the most evocative and intriguing photos are of the local amateur dramatic performances in which Blok and his future wife took leading roles. A couple of kilometers along a rural lane through fields of cows brings you to the country estate of Shakhmatovo, where Blok spent most of each year from 1881 until 1916. The fields around are full of the flowers he loved; one of Blok’s poems uses as symbols the “luxurious clover” and “innocent cornflower” in a landscape that is clearly Shakhmatovo. This may be the reason why fans would gather in the fields here for an annual poetry festival even after the house was destroyed. The large rock near the gate marks the place where the festival was held before the house and gardens were reconstructed. Although, like many similar house-museums in the Moscow area, this wooden house is actually a reconstruction (the real one burned down in 1921), it has been recreated with so much care that it is full of atmosphere and charm. There are always fresh flowers from the garden in vases on the windowsills. Much of the original furniture, which was removed when Blok and his family were evicted after the revolution, has been painstakingly relocated, and the details of each room have been made as authentic as possible. Blok’s light-filled study, upstairs with views across the fields into what Blok called “the many-verst Russian blue distance,” is quite beautiful. Behind the main house, a series of beautifully kept paths run through a forest, full of lilies, wild strawberries and columbine. While restoration continues on some of the outbuildings, the finished areas are almost perfect. Visitors can combine a trip to Blok’s house with a couple of hours in the nearby town of Solnechnogorsk, an hour’s bus ride north of Moscow. Solnechnogorsk, whose name basically means “sun city,” grew up as a waystation on the road to Petersburg. In the 19th century, there were attempts to build a canal here to transport stone from the Volga for Moscow’s original Christ the Savior cathedral. After 20 years, the canal was still less than 10 kilometers in length, and then, in 1851, the railway opened, making the canal redundant. Lake Senezh, one of the biggest lakes in the Moscow region, was created in the process and is now a hugely popular place for relaxing, fishing and boating. The sculpture park and well-curated local history museum are worth visiting too, but the real draw is the massive lake with its tree-lined shores and beaches.